The Banana Cream Pie won the poll, and I must say I was pleased with that! Not because they were my favorite, I voted for the Apple Galette myself, but because I had already bought a bunch of bananas a couple of days ago (the bananas need to be ripe). They had a jumpstart in the poll, that seemed to be uncatchable by the Apple Galette or the Orange Meringue Pie ... But Piere Hermé's Apple Tart was getting closer and closer as the days went by. Anyways, I hid the bananas in my room (for fear of someone eating them) and the aroma I smelled every day waking up was quite delightful! Enough talk, here's business: I give the Banana Cream Pie 4 out of 5. It tasted really nice, and also very fresh. It doesn't get 5 out of 5 because I missed a hint of sweetness that I anticipate on when baking a pie. This is a halved recipe. If you double this recipe, it makes enough for 1 double-crust or 2 single-crust 9-inch pies. But you will only need 1 single-crust. - In the bowl of a food processor, combine flour, salt, and sugar. - Add butter, and pulse until the mixture resembles coarse meal, 8 to 10 seconds. - With machine running, add ice water in a slow, steady stream through feed tube. Pulse until dough holds together without being wet or sticky; be careful not to process more than 30 seconds. To test, squeeze a small amount together: If it is crumbly, add more ice water, 1 tablespoon at a time. - Divide dough into two equal balls. Flatten each ball into a disc and wrap in plastic. - Transfer to the refrigerator and chill at least 1 hour. Dough may be stored, frozen, up to 1 month. - Preheat oven to 375F/190C. - On a lightly floured work surface, roll out dough to a 12-inch round, a bit less than ¼ inch thick. - Fit dough into a 9-inch pie plate. Using kitchen shears or a sharp knife, trim crust to a ½-inch overhang all around. Fold under overhang so it extends slightly beyond edge of pie plate. Crimp edge as desired. - Prick dough all over with a fork. - Brush rim of dough with beaten egg. - Chill pie shell until firm, about 30 minutes. - Line chilled pie shell with a round of parchment paper, leaving a 1-inch overhang. - Bake until edges of crust just turn golden, 15 to 20 minutes. - Place pie shell on a wire rack to cool completely. - Prepare an ice bath; set aside. - In a bowl, lightly whisk egg yolks; set aside. - In a saucepan, whisk together milk, granulated sugar, cornstarch, and salt. - Bring to a simmer (do not boil), and cook, whisking constantly, 3 to 4 minutes. 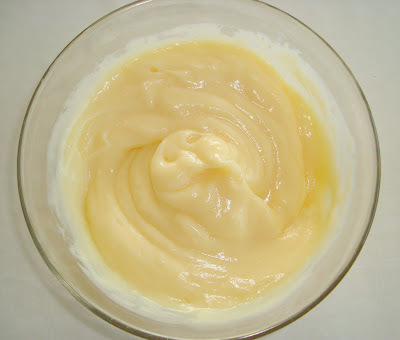 - Whisk a quarter of hot-milk mixture into egg yolks; whisk in remaining milk mixture. - Strain into a clean saucepan, and cook over medium-high heat, whisking constantly, until custard is thick and bubbles appear in center, 2 to 3 minutes. 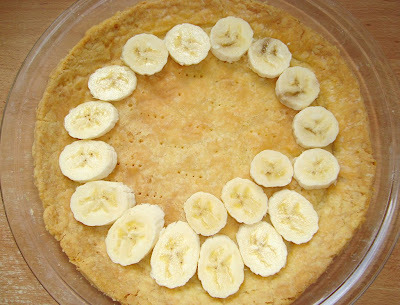 - Cut 3 or 4 (I used 2) medium ripe bananas into ¼-inch slices, slightly on the bias. - Beginning at the edge of the piecrust, arrange the slices in slightly overlapping rows. - Cover with the custard, using an offset spatula to smooth it into an even layer. - Using a small offset spatula, spread the whipped cream on top of the custard. - Refrigerate pie, loosely covered with plastic wrap, for at least 1 hour or up to 2 days. 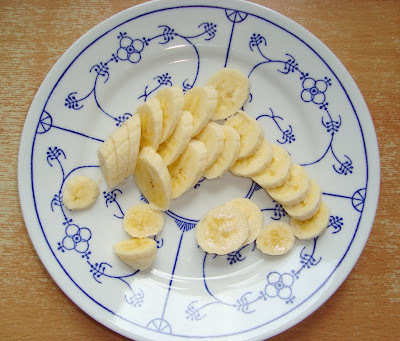 - Just before serving, cut 4 medium ripe bananas in half crosswise, then thinly slice lengthwise. 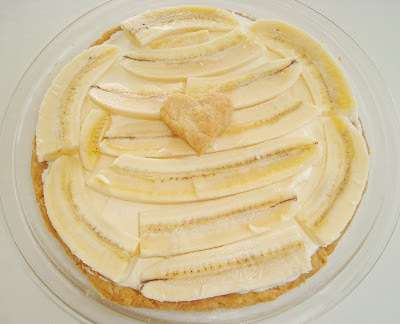 - Arrange the bananas slices in three slightly overlapping rows on top of the whipped cream. I ate a banana-slice here and there. In total I used 6 bananas. The recipe recommends 7 to 8, but I think this was fine. I'm glad I didn't use 3 cups of whole milk, I think that would have made it too rich. This custard was perfect for the pie. I baked a little heart out of the excess dough and placed it on top. 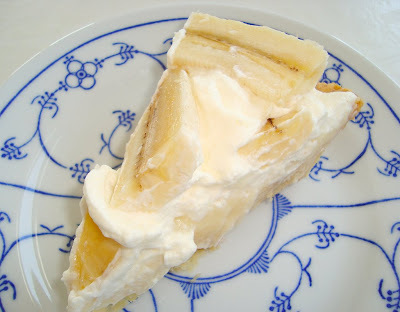 I'm not a huge fan of bananas but this pie looks heavenly. Looks nice and light and creamy! Good job!